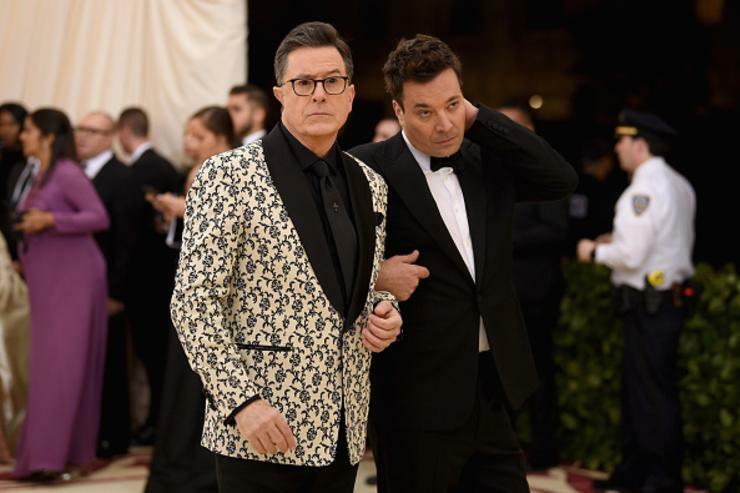 Colbert and Fallon fired back at Trump, with the help of O’Brien, in a short sketch that aired on both CBS’ The Late Show and NBC’s The Tonight Show. In the sketch, Colbert calls Fallon on a video chat. “Hey, low-life,” Fallon greets Colbert. “Hey, lost soul,” Colbert responds. After reminding Fallon to “be a man,” the two talk about Trump’s rally. “Did you see Trump’s rally last night?” Fallon asks Colbert. “I heard he said some pretty bad stuff about us. I heard he said we were all no talent, low-life, lost souls.” “Well that’s not right, that’s Conan,” responds Colbert. Conan seems to be lost in time in the sketch, and can’t believe that Trump, “the real estate guy who sells steaks,” is president. “How’s he doing?” asks O’Brien. “Not so good,” Colbert replies. At the end of the sketch, Fallon and Colbert agree to grab food at the Red Hen, the restuarant that refused to serve White House press secretary Sarah Huckabee Sanders.